The Winter Gardens Opera House has been the scene for political events through the years, with many appearances by the British prime minister. Billy Graham spoke at Winter Gardens in 1982. Protestors display a papier mâché statue of Jesus. Opposition to the Lancashire Festival of Hope began immediately after the event was announced. “I’ve never seen anything like it,” said Festival leader Stewart Whitley. Despite months of fierce opposition from mostly LGBT groups, the three-day Lancashire Festival of Hope drew more than 9,000 people from across North West England Sept. 21-23. 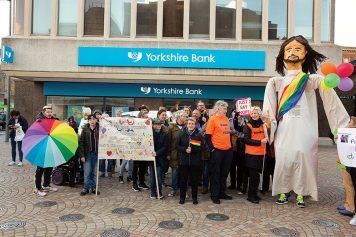 About 40 protestors stood across the street from Winter Gardens in Blackpool the first night, carrying signs and displaying a papier mâché statue of Jesus wearing a white robe and a rainbow sash. Fewer came on the second and third nights. 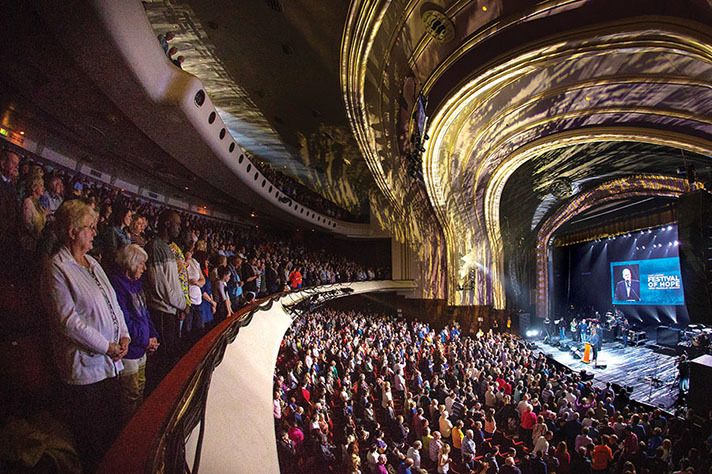 Inside Winter Gardens, the crowds filled the Opera House, spilling over into the Empress Ballroom, where they watched live music and Gospel messages from Franklin Graham on a large screen. And each night when Franklin preached, victory was declared: a 100-year-old woman prayed for forgiveness of sins for the first time. A 3-year-old accepted salvation, a 13-year-old asked Christ to take control of the decisions in his life, and a Muslim imam came to see for himself what all the controversy was about. A ferris wheel is among the attractions along the coast in Blackpool. 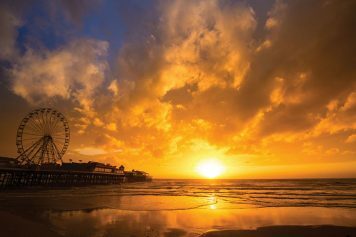 Blackpool, a seaside town of about 142,000, sits on the Irish Sea about 240 miles from the global city of London. It was built as a holiday resort during the Industrial Revolution, grew through the Victorian age, and attracted up to 30 million tourists a year in its heyday. But with the onset of affordable air travel, many tourists took their holiday in the warmer climates of Spain and other Mediterranean nations. Today, only about 10 million tourists travel to Blackpool each year, and the town, known for its glistening lights, Blackpool Tower and ballroom dancing, is plagued with alcohol abuse, drug abuse, domestic violence and mental health issues. “The Britain that sent the Gospel out to the nations in years gone by is not the Britain of 2018,” said Steve Haskett, Anglican pastor of St. John’s Church. Many of Lancashire’s churches today preach a social Gospel. Christianity is being squeezed out of much of the mainstream, Ainscough said. 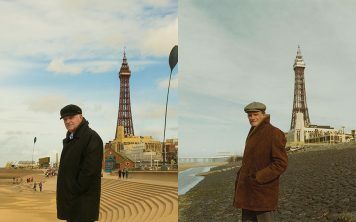 Franklin Graham stands where his father stood during his 1982 Blackpool Crusade. “We’re going into more and more of a confined space. And the more confined the space, the less the opportunities for evangelism. When I was listening to Franklin last night, I was thinking, I wonder how many more years we will have this opportunity for people like Franklin to openly speak about the Gospel message. There are Christians in some parts of Lancashire who have no church to go to. And pastors struggle as well, some with several small congregations under their care, and others feeling isolated with one small congregation. “There is a real need for Biblical and prayerful support and encouragement and Christian fellowship for so many,” Ainscough said. 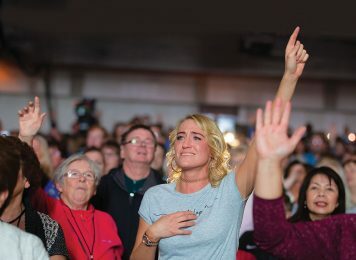 More than 2,000 people came to Winter Gardens the first night of the Festival, and local pastors and Christians watched in awe as the light of Christ penetrated the darkness. Reverend Oldland’s daughter brought her boyfriend, whom Oldland and his wife had been praying for, and he accepted Christ. Worshipers rejoice during music before and after Franklin’s Gospel message. Pastor Peter Lilicrap and his wife, Jill, brought their friend Ganga whom they had been praying for. They kept silent when a stranger broke into their group, and they were glad they did. The stranger sat next to Ganga, and it turned out the two women had known each other in previous years. Both of them went forward at the invitation to make commitments to Christ. 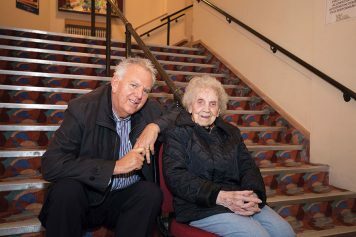 Eighty-one-year-old Maude Todd of Blackpool lost her husband in April, and that set her mind to thinking. Both her son and daughter had talked to their dad about giving his heart to Christ, but they were uncertain if he had. When Maude heard about the Festival, she got tickets as quickly as she could. And when the invitation was given, she came forward and asked Christ to forgive her of her sins. “I didn’t want to die in sin,” she said. More than 400 people made commitments for Christ at this breakthrough event. Margaret “Peggy” Ratcliff turned 100 years old July 29. She stopped going to church decades ago or even thinking much about God. Her neighbor David Barnfield would mention Jesus from time to time, but she wasn’t interested. “I haven’t done anything wrong,” she would say. Ms. Peggy never married, and all of her siblings are gone, so David helps look after her. “She’s like a second mum to me,” he says. On Saturday, Sept. 22, while they were shopping, he asked if she would fancy going with him to the Lancashire Festival of Hope in Blackpool the next day. She agreed and said she would be ready at 2 p.m. He popped over at 10 a.m. the next morning to check on her. “I wanted to make sure she was still going,” he said. Then his voice softened. “There may not be another time,” he said. “Well, I can’t walk down there,” she said. David hurriedly went in search of a counselor. And at 100 years of age, Ms. Peggy was born again! In April of 1954, 13-year-old John Mosey went with his Sunday school teacher to a relayed broadcast of Billy Graham’s Harringay Crusade. God has taught him a lot about forgiveness through the years. Through the tragedy, John was invited to speak at schools about the bombing, and each time he talked about forgiveness. He has preached in Westminster Abbey at anniversaries of the event where the prime minister and members of the royal family attended, and has written to the queen and Prime Minister Tony Blair on spiritual matters. 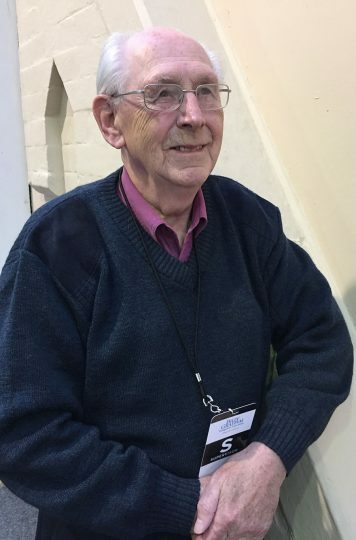 John, now 78, has seen hundreds come to Christ. Ten years after he accepted Christ, he baptized both his parents. Both his son and daughter are Christians; in fact, his son is now his pastor.